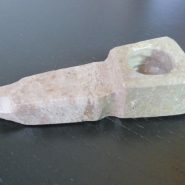 Home > Shop > Lovely organic stone smoking pipe. with free screens. Lovely organic stone smoking pipe. with free screens. Lovely handmade organic onyx stone smoking pipe half brown half clear 3.5" long. free pipe screens free shipping US only. Unique handmade natural clear onyx pipe the way to see your smoke going out of your pipe like fire at night time. buy me and try me. each stone smoking pipe is different then the other. it`s very cool to have your own unique stone pipes. best way to smoke stone pipes and to feel connected to nature.